In our most recent visit to this budget monitor speakers page, we decided to leave the existing four models as they were – why fix something that isn’t broken?! However, we decided to add a fifth model – our new chart-topper, the excellent PreSonus Eris E3.5. If you are looking to get into music production and make some audio worth listening to, a set of decent monitoring speakers should be one of the first things on your list. Should You Save Up for a Better Set of Monitors? Why Not Buy a Good Set of Bookshelf Speakers for the Same Price? However, considering the requirements of proper monitoring, the question has been asked: can beginners do it on a budget? Are speakers under $100 worth your time or do you need to splash out on a set of high-end $500 monitor speakers from the very start? The underdog which has proven to be quite competitive with great hardware. Pretty compact set of monitors that's built for use on the go. Decent performance and great waveguide design makes these speakers a great choice. Tascam VL-S3 are proper studio monitors designed for a very specific application. They are super compact but pack a lot of heat. Tascam has managed to answer the needs of users who work in tight spaces and whose studios are pretty small. VL-S3 will get you the performance you need in such environments, while completely blowing much better models out of the water. Their response is incredibly flat and would be borderline perfect if the bass could reach lower than 100 Hz. However, that lack of low-end response is perfectly normal for 3“ speakers, so VL-S3 isn’t alone in having that single flaw. If you are after small, capable and relatively powerful speakers, Tascam VL-S3 is the answer. Alesis has given us some pretty awesome budget monitoring solutions. The M1 series of speakers is just another example of that. These puppies were designed to bring a bit of extra versatility, as well as meet the needs of producers who are frequently on the road. Lightweight, portable and fairly powerful, these speakers offer a great balance of price and performance. Once cool thing is the Bass Boost feature, which essentially turns the M1 monitors into standard desktop speakers. This is awesome for those occasions when you just want to listen to some music. All in all, this set of speakers offers a lot for the given price, making them a solid value package. Mackie CR3 monitor speakers have been one of the most popular choices for a long time now. They are at the very bottom of the CR series as a whole, but they are more than capable of carrying their own weight. What we have here is a set of active speakers with some 50 Watts of power under the hood. Speakers are of standard size for this segment, but they are properly voiced. There is definitely some bias, but again, that is completely expected in this price range. Those who are looking for a proven set of budget monitors that can be used for multimedia as well should definitely check out Mackie CR3. 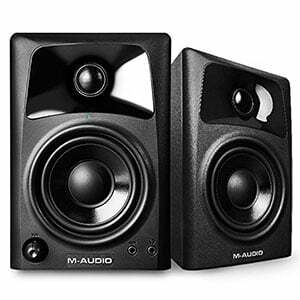 M-Audio AV32 have been, and still are some of the go to monitor speakers in the affordable segment. You get that standard 3“ woofer, 1“ tweeter configuration, but with a twist. M-Audio has used a pretty aggressive waveguide design that opens up the stage a bit when you need to hear everything in your mix. What this speaker lacks are features. However, at this price, we simply can’t complain. With 20 Watts of power combined, you are looking at a fairly decent output for use in smaller studios. It might take you a bit of time to position these where you are getting the best results, but that’s just the fact of the matter. Naturally, for a set of budget speakers, you shouldn’t expect the same build, features or performance as you would from a high-end set. However, things don’t necessarily need to feel ‘cheap and nasty’ either. These days, build quality is surprisingly good – especially on the models we have highlighted, with sleek designs and robust construction. Of course, they tend to be quite small and lightweight, and are definitely near-field units. This means that you have to be quite close to the cabinets in order to experience their full potential. However, this makes them perfect for desktops and home studios. What about performance? Regardless of the low-end price, you should still expect a relatively transparent sound. After all, this is the main reason you are buying studio monitors instead of general consumer speakers. The flatter the response across the frequency range, the better – in fact, some of the best monitors on the market are flat as a pane of glass! While it’s rare to find a set of $100 monitor speakers that will offer complete flatness and clarity, you will be able to find models that are flat enough to allow you to mix properly, identify audio issues and correct them with ease. In this budget price range, you can also expect your speakers to lack bass. Manufacturers tend to use small, low-frequency drivers, many of which are around 3″. This pretty much physically prevents them from giving too big a thump. However, everything above around 100Hz should be quite decent depending on the model. It’s a good question! Not everyone can splash out on expensive monitors immediately, so should you wait until you can afford higher-end equipment? The answer will depend on your budget, level and aspirations. Firstly, for a beginner, investing a considerable chunk of your hard-earned money into an expensive pair of passive monitors (those that are unpowered) can be a bit counterproductive. Doing so not only ties down funds that could have been used for another piece of equipment (such as some decent studio headphones, but it also means that newbie producers also have to buy a power amp and other gear before they can start mixing. Also, if you have to spend time saving up to afford better speakers, that means an extra few months of waiting. That’s time you could be using to mix and produce! As music production is a skill that takes time to develop, starting today with a cheaper set of speakers is much better than starting in a few months with a better set. Of course, if you are a beginner with a big budget then knock yourself out – go mad and spend hundreds on the best set of speakers money can buy (honestly, we wouldn’t blame you!). But, for the rest of us, cheap speakers will do the job. Using bookshelf – or general-purpose – speakers for monitoring seems like a feasible idea, but it’s not that suitable. Right off the bat, we have to emphasize that bookshelf speakers are biased in one way or another, while budget bookshelf speakers are even more biased in order to hide some of their imperfections. Mixing music with bookshelf speakers is like trying to listen to somebody in a club where the music is just too loud. You will probably understand what that person is talking about generally, but you will miss out on most of the details and the nuances of their story. While flat monitor speakers may not be the best thing for enjoying music on a daily basis, their transparency and accuracy is vital if you want your music to sound half decent. Bookshelf speakers have their place, but mixing music is definitely not it. There’s not as wide a range of choice in the affordable monitor market compared to, say, those studio monitors costing around $300. However, finding quality and value on a budget is certainly not impossible – providing you know where to look. The models we have highlighted above, in our opinion, offer the best in terms of build, performance and value in this sub-$100 market. If you are just entering the world of music production and you don’t have a huge budget, this is a good place to start.